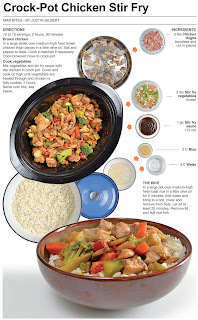 I realize that slow cooker stir fry is really an oxymoron. 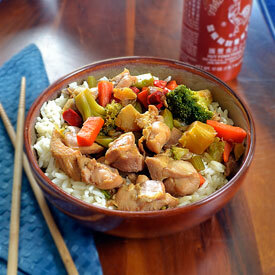 I guess I could call it slow cooker chicken and vegetables with stir fry flavors, but that's just not fun. This pot of yummy goodness tastes like a plate full of stir fry from a fast-food Chinese joint. I could have pumped up the flavors a little by adding some sautéd ginger and garlic but for a dish that will serve fifteen at a pot luck, this totally does the trick. I made this in the afternoon and didn’t have to serve it until that evening, so for the purposes of the event, I mixed the rice together with the vegetables and reheated the two together before serving. I recommend this method if you’re taking it on the road just for the ease of travel. This is yet another dish to add to my collection of recipes made to serve a crowd. It’s the first to be Asian inspired and I think I’m going to refine this in the future, like I mentioned in the beginning, I could do a few things that are relatively simple to punch up the flavors but this simple mix really does the trick. It's a low maintenance crowd pleaser. I served this with srirach on the side. A friend of mine at the get together put a fair amount of sriracha on his stir fry and that's when the fun began. I love to watch people eat really hot stuff. It seems that as they eat the dish the bites get quicker and quicker, the spicy heat is addicting and it's almost as if they're stoking the fire. Sometimes they’ll even sweat or have a runny nose. I can always tell when someone is indulging in something spicy and hot. Sriracha is one of my favorites to eat and observe being devoured, it makes most domestic sauces labeled “hot” seem like a mild salad dressing – And it really hits the spot if you love the spice. In a large skillet over medium-high heat brown chicken thigh pieces in a little olive oil. Salt and pepper to taste. Cook in batches if necessary. Once browned move to crock-pot. 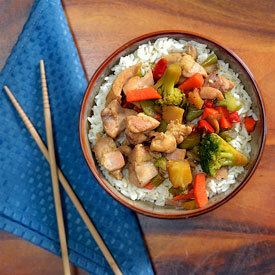 Mix vegetables and stir fry sauce with the chicken in crock pot. Cover and cook on high until vegetables are heated through and chicken is fully cooked, 2 hours. 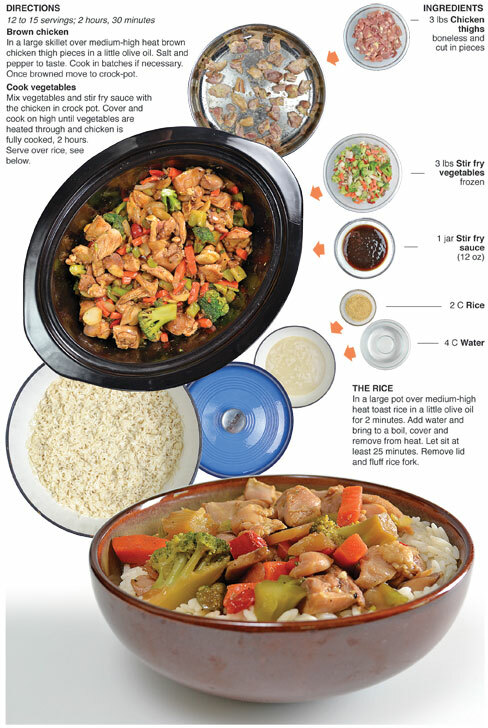 Serve over rice, see below. In a large pot over medium-high heat toast rice in a little olive oil for 2 minutes. Add water and bring to a boil, cover and remove from heat. Let sit at least 25 minutes. Remove lid and fluff rice fork. I have made this recipe tons of time and its a keeper here for my family..